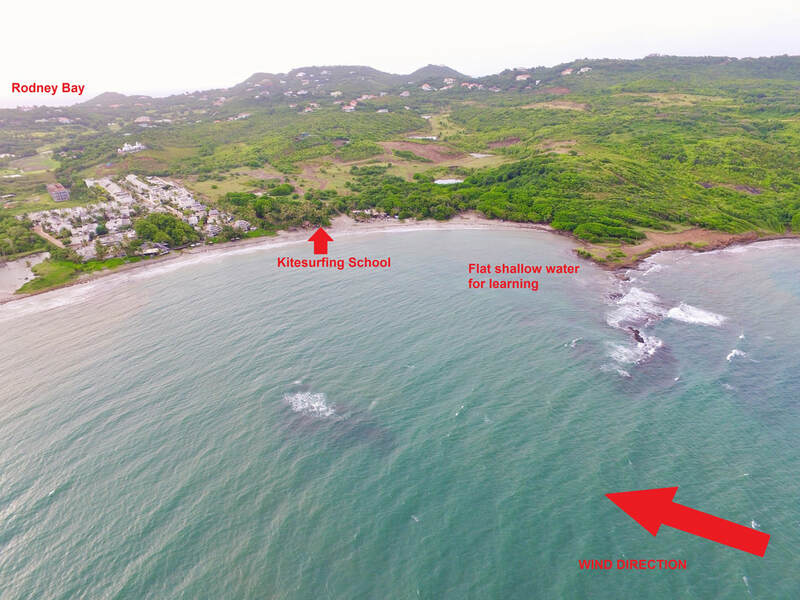 We are based on Cas en Bas beach towards the north end of the island of St Lucia. A c-shaped bay, Cas en Bas is on the Atlantic side of the island benefitting from the constant breezy trade winds. It has protection from an outer reef, meaning the water is always flat inside the bay, with the swell breaking upwind outside the bay. Only a short 10 minute drive away, passing the St Lucia golf course, from all of the main hotels and restaurants on the island. It is in Cas en Bas where you will see most of the local riders out enjoying the fresh trade winds and beautiful Caribbean water. With only a few locals who kitesurf on the island, they are a pretty friendly bunch who are more than willing to help out at any time or share their knowledge of the island to help you enjoy your stay. The international airport is Hewanorra airport (code UVF) which is down south in Vieux Fort, 1 1/2 hour drive away from Cas en Bas beach. The inter-island regional airport is GFL Charles airport (code SLU) which is in Vigie, 1/2 hour drive from Cas en Bas beach. There are plenty of accommodation options available in the area, please go to the links page for more information.